The inevitable growth of retirement age. 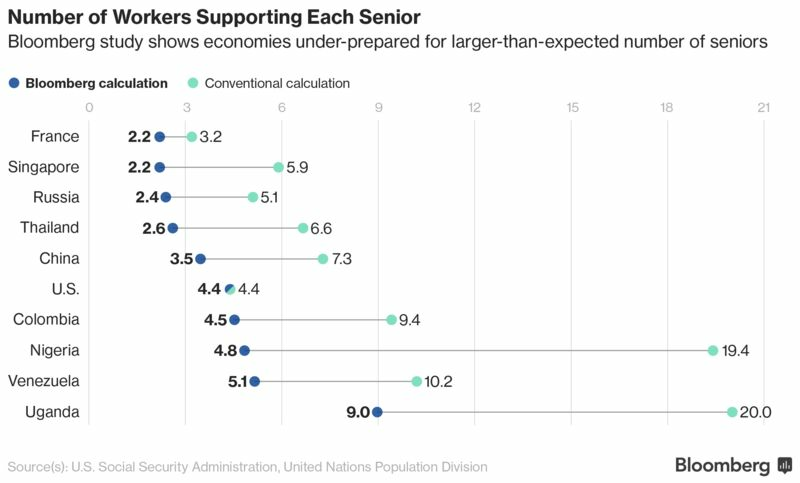 The graph below is another justification that the retirement age does not correspond to the levels required for economic development in developed countries. Current retirement standards were developed under a different life expectancy. Some may claim that the graph takes into account people under the age of 20. This is true, but birth growth rates in the world slow while the number of the retired accelerates (especially in the US). The future reality is that there is no avoiding the increase of retirement age especially in developed countries. Otherwise, it means an increase of taxes on business and, consequently, a drop in economic activity. Politicians will have to face a tough choice: either to sacrifice business and working the electorate or the retirees. As cynical as it may sound, capitalist countries will choose the first.